I’m so into fall mode right now. There’s lots of colourful leaves on the trees and crisp leaves on the ground. Some days are rainy and cool while other days are shockingly warm – look ma, no cardigan required! Autumn gives me all the feelings and I’ve been eating apples and yams and soup as required. But sometimes you need to look ahead. I don’t know why mint makes me think of winter but it does. I could have made some soft and cakey pumpkin oat chocolate chip cookies (my husband’s favourite, by the way) but I spied a bag of mint chocolate chips hidden in the back of the freezer and I couldn’t ignore the mint urge any longer. So, I decided to make something completely different. 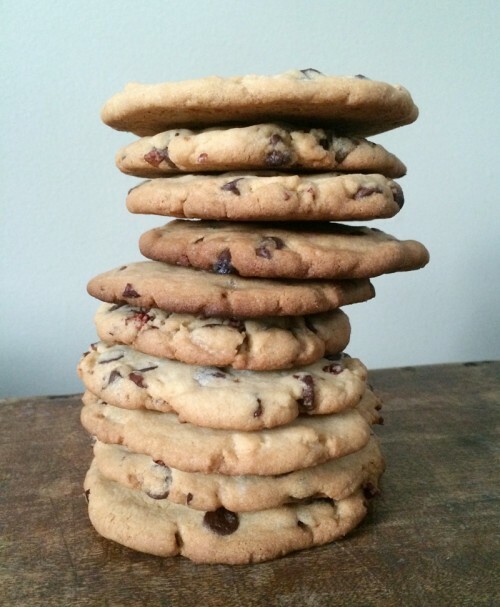 Let me introduce you to these crisp, thin and oh so cool cookies. They are not only lookers, but they taste perfectly minty (not too minty!) and chocolatey and buttery. 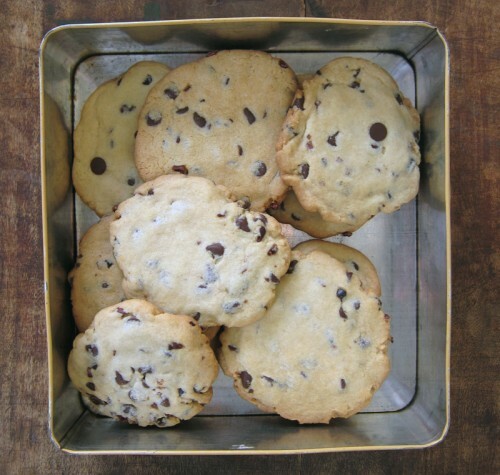 A tiny little drop of peppermint oil alongside the mint chocolate chips gives them the right amount of flavour. 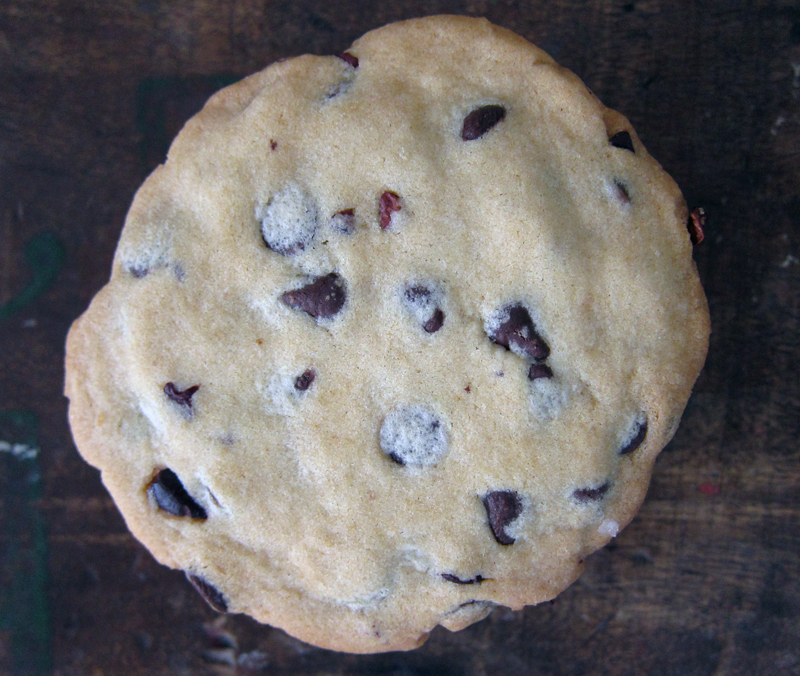 I love a good crispy cookie and this recipe delivers. The texture is spot on – not hard but a good balance of crisp and the slightest chew in the centre. These are really great cookies. The key to getting them to look so good is to use a glass to flatten out the cookies once they’re on the cookie sheet, just before baking. I imagine that if you’re looking for just a regular plain chocolate chip cookie you could drop the mint for vanilla and swap in some milk chocolate chips (or dark!) and you’ll also have a very fine cookie. Whatever way you bake them up, I’m sure they’ll be the ideal accompaniment to your favourite season. 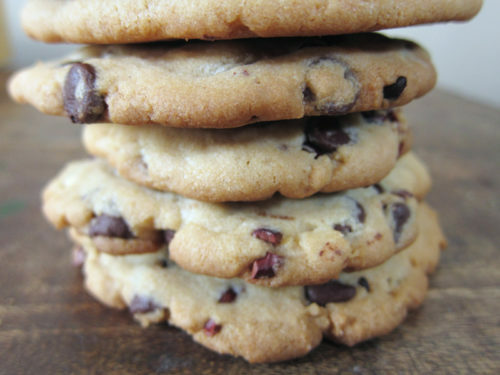 Now go and eat some cookies. I used peppermint oil because that’s what I had on hand, but you could easily substitute in some peppermint extract. Also, if you wanted to sub in some cocoa nibs, it makes a most excellent addition! Preheat oven 375F. Line 2 cookie sheets with parchment paper. In a medium sized bowl, whisk together the flour, baking soda and salt. Set aside. In a large bowl, cream together the butter and sugars until fluffy. Add in the vanilla, peppermint oil and egg and mix well. Slowly add in the flour mixture and combine. Dump in the mint chocolate chips and stir until evenly distributed. Use a tablespoon to scoop out the dough and roll into a ball. Place on cookie sheet and use the bottom of a glass to flatten each ball, keeping cookies about an inch apart. Bake for 9-12 minutes, or until lightly golden brown. Remove from oven and let cool on tray for 5 minutes before transferring to a cooling rack. Makes about 30 cookies. Ooh, that glass-flattening technique is brilliant. 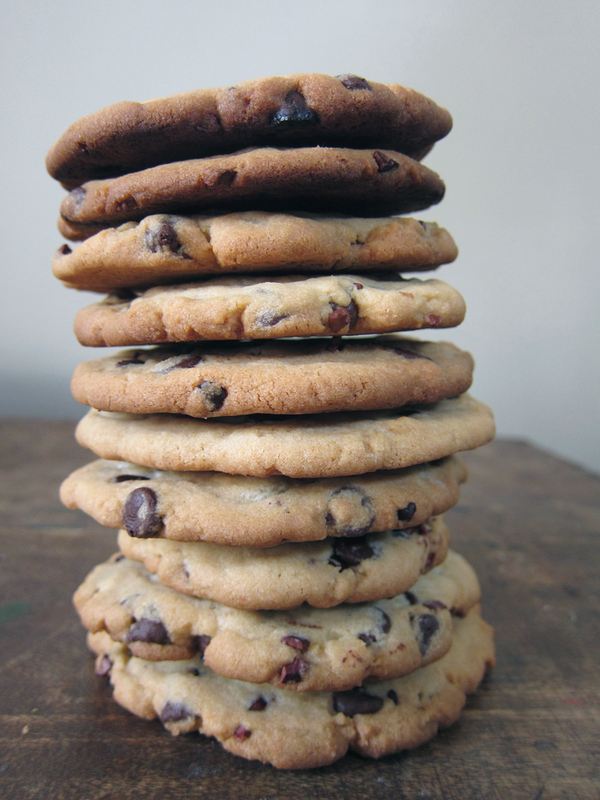 Just like these cookies. Mint + chocolate is one of my favorite flavor combinations and I have no idea how I’ve gone 26 years without adding mint to my chocolate chip cookies. Love this minty twist on the classic chocolate chip cookie, great idea to add peppermint oil. Can’t wait to make these! 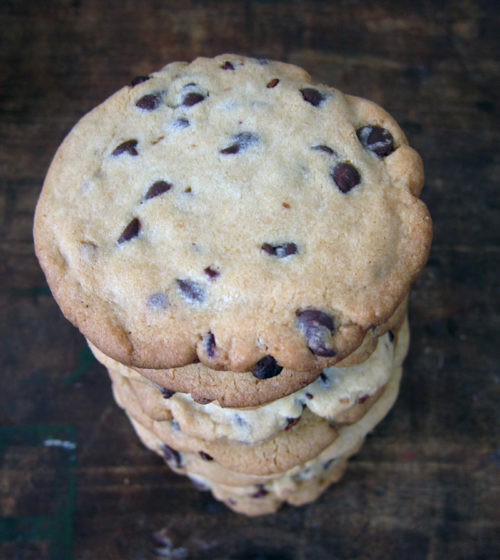 Mint chocolate chip is the best flavor combination ever- these cookies sound so, so good!! Yes, it is Ashlae! As for the mint, do it. Now. It just feels right. OK I am looking for a cookie that is CRISP. Are these crispy all the way through? Would they be ok covered in chocolate? wow i like very much this.